I know many people don't like this small bitter gourd ( some say it indian bitter gourd,maybe Indian people like to eat this kind of bitter gourd ) because it very bitter.But i like it( i only like cooked bitter gourd).Normally my mother will use small bitter gourd to make soup.Pork ribs small bitter gourd soup (苦瓜排骨汤).It won't feel bitter after cook. For people who high blood pressure,every morning drink one glass of small bitter gourd,green apple and one stick of celery juice.It very good.Bitter gourd more bitter is more good.It also can help to cold down our body temperature.If you has denggi,double boiled smalll bitter gourd with frog (田鸡).It can cold down body temperature and frog it high in protein. I remember when i do detox.Every morning i have to drink this bitter gourd juice.I can not direct drink like that.I add 1/2 lemon juice on let.I can not stand the bitter taste.Raw bitter gourd is very bitter. 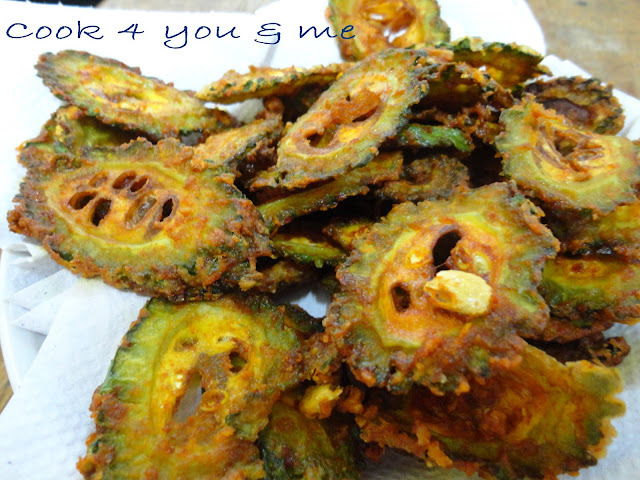 This crispy fried bitter gourd you can found it at mamak store.It is a Indian dish.It is not spicy but very fragrant with spices.Taste a bit bitter. Wash the bitter gourd.Slice it as thin as you can.Don't remove the seed unless it's too big and rough. Mix the sliced bitter groud with all the spices,salt and oil.Let it marinate for 10 minutes. Then sprinkle rice flour and mix well. Deep fried until golden brown at medium heat. No matter how ppl say, bittergourd soup is not bitter, it's still foooooooo like hell to me, LOL. this is also a must take for me whenever i go for banana leaf, somehow it goes very nice with curries!